Vegetables contain a variety of vitamins and other nutrients vital for good health. In some cases, it can be difficult to eat the recommended amount of fruits and vegetables everyday. While vitamin supplements can help fill in nutritional gaps left by an inadequate diet, they are not a replacement for vegetables and other food groups. Vitamin C is abundant in many vegetables, including broccoli, kale and onions. It is needed for proper immune function and has antioxidant properties that help prevent cellular damage caused by free radicals. Vitamin C is also vital for collagen formation and acts as an antihistamine to prevent allergic immune reactions. Deficiency of vitamin C can lead to scurvy, a potentially fatal condition. According to Ohio State University, red bell peppers, broccoli and green bell peppers are the richest vegetable sources of vitamin C. The recommended intake for healthy adults is 75 to 90 mg per day. Vitamin A is a fat-soluble vitamin found in many orange and yellow vegetables. It is needed for the formation of retinal, a light-absorbing molecule required for proper vision. It also plays a role in the growth of cells while helping maintain skin health. Vitamin A in the form of beta carotene is most abundant in vegetables like carrots, squash and sweet potatoes, though it can also be found in many green vegetables. Because it is fat-soluble, vitamin A can be dangerous in overdose. The daily recommended intake for adults is 600 IU. Multivitamin supplements contain a variety of vitamins and minerals, such as vitamin A, calcium and zinc. Because nutrients are needed in combination to carry out their functions, multivitamins can be helpful in meeting your nutritional needs. According to the Harvard School of Public Health, taking a multivitamin plus an extra vitamin D supplement daily is a good way to supplement your diet and get the nutrients you need. 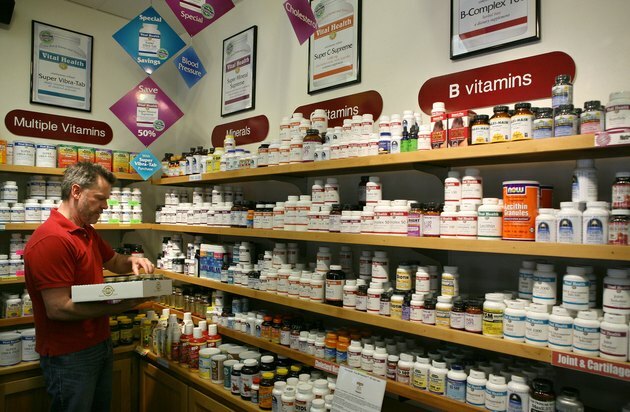 Single vitamins rarely occur in isolation in nature. Most vegetables contain a combination of vitamins, minerals and phytochemicals that give them their unique health properties and cannot be obtained from supplements alone. For this reason, the Harvard School of Public Health states that eating a healthy, varied diet is more important than taking vitamin supplements.